Want to know what to plant to help native pollinators in your area? Check out the free guides on the website of the Pollinator Partnership. Wish I’d seen this before my book Touch A Butterfly: Wildlife Gardening For Kids went to press because I would have loved to list it and these folks are doing such important work. 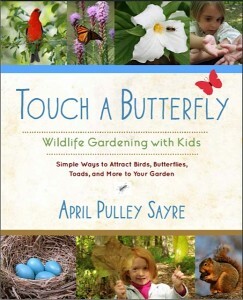 Touch a Butterfly: Wildlife Gardening With Kids will be available in bookstores April 23, 2013 and can also be ordered from www.roostbooks.com. They’re the publishers of the I LOVE DIRT book from a few years ago. It’s geared for families, educators, and interested kids in upper elementary grades, as well. It’s my 25 years of knowledge about seeing the landscape through the eyes of animals and gardening with their needs in mind. Probably my most personal work. Kids and educators intrigued by my book The Bumblebee Queen, there’s finally a truly great publication I can send you to for follow up. This has been on my wish-some-expert-would-write-this dream list for years. Hooray for USDA and all the authors involved! Fisheries biologist John Magee in NH, thanks for giving me the heads up on it. The publication is a free, downloadable pdf, you can store it on your computer, ipad, iphone, whatever. Check it out! Kids did a bumblebee study that was published in a major science journal, Science. Article about their article here. Yes, I’m still following bumblebee news, to share it with those of you reading and creating materials to go with my book, The Bumblebee Queen. Here are some other activities, within this site, for bumblebee fun. The United Nations Environment Program also just released a study about bees worldwide.